Well done, good analysis. I think you really found the spot were the crime took place. I found a better coppy of the video, posted by Misrata rebells four days ago. They accuse the libyan army for the crime of course. Just today the NYT brought a story about the rebel-agression against the Mashaashia tribe, that also lived in Qawalish and to which the victims shown may belong. I think most probably the crime was conducted in the beginning of june, when fighting took place in the Qalaa region. The press release from the rebels is important of course. But it is mysterious that they first called for investigation and international attention two month after the crime and some days after the video was published. I think if this was realy done by loyalists, we already had heard much more about this crime from the rebels, the human rights organisations and the media. Now it looks as if they just only react on the publication. I can take this up in comments for the moment. Damn, really wish I had more time. ah, on checking, just BEFORE Libya SOS... part of my point fell apart in mid-sentence. Fine. I'll follow this wherever it goes. If the gov. did this, well, they're under a lot of pressure, but it's not cool. A major allegation of abuse and evil would finally be true. Calling for an investigation is odd. Have they ever done that before? The answers are always clear, the solution always more weapons and help getting rid of Gaddafi. Never to investigate. Not that a TNC probe would mean a damn thing, but this shows their openness to an "investigation" which might be an answer to their earlier bulldozer work. They fear the truth, I suspect, hence the show of not seeming to fear it. Will now check for any news. Fixed the links - thee bad out of four, now none bad out of three. That was sloppy. Anti-Nazi Hippy argues this isn't Qala'a at all, but Dafnya. Dunno. I see one of the rebel versions has subtitles. I'm checking those out. Will try and report back tonight. Yeah, I'm not so sure of the location - might be a hilltop, could possibly be somewhere else entirely. I didn't compare carefully enough before - will update that as well in time. The rebels themselves gives the date of june 2nd in their press release which sounds serious for me because that were the days of figthing in the Qualaa area. If the video realy is from there, I don't know if there are similar sandy forests elsewere in the region. The rebels also say the area is mined now so it's possible that tey dont realy want a fast examination. Due to the subtitles, the filmers speak army slang if they really call the killed rats. But that doesen't mean much, even then it could be a propaganda orchestration. It's probably easier for the rebels to imitate army slang than to get fiting uniforms. My feeling says the crime happend two month ago and the rebels made a propaganda video but then dicided better not to publish it. But then, a copy was published unarranged (perhaps by Misrata rebels ?) and the Nafusa rebels had to react on that. But of course there are other oportunities. And it is not less important to analyse the crime if it was done by the army. But this is hard to belive for me because the whole scene looks more like ethnical cleansing than execution of captured fighters. I agree the talk of mining sounds like a possible dodge, by the way. Doesn't seem all that vital an area to mine. also from august 5th, so that one from Misrata is probably a copy of this one. Moreover the garbage gives a hint on a nearby road or frequently used track, that's quite typical for north african roadsides. I think a plane is passing by (starting at 0:40). But this last point will not be very helpfull according to the number of NATO sorties. Thanks becouse you will help to show the truth. And thanks becouse you finded exactely Profil who reported video on The LibyaSOS chanel. We added this link and link to your story on post. We hope that you will be succesfull, and you will find who killed this Libyans. S.O.S., so cool how you can be a "." Thanks for the comment and sorry for the delay. Which profile? What was it that happened? Could use more info there. I'm still confused by this evidence, but getting surer, for one thing, that this isn't the Qala'a area. I suppose there could be spots like this, maybe, but it's only a nook a few miles wide and I've been all over it in Google maps. Why get the area wrong? Mistake? Misdirection? Or am I still wrong somehow, missing the one flat little grove that explains it? And the speaking - what do you make of the transcript provided (above)? As an Arabic-speaker, can you are anyone you know make a detailed trasncript in Arabic text, actual words spoken? Break down the different speakers, etc? This would help a lot - I can get auto translations even, plus you could translate it yourself, and we'll have both to ensure transparency and invite better translations. This one is worth that level of scrutiny. Will send this in a youtube message too. "2. Providing de-mining experts to clear mines from the Al-Mal’ab Forest area. This will allow for the investigation team to carry out their work to discover the mass grave (s)." If the graves are in al-Mal'ab forest, the video probably was recorded there also. The place was a retreat area of loyalist at that time. Maybe not only soldiers, but also civilians? as the location of the crime. That is probably the "Almliab scouting camp and agriculture centre" mentioned in the press release from june 3rd. Damn, I should have caught that already, either from looking closer at the text or less close at the map. It's outside the immediate area I was searching, but only about ten miles away, no long drive from Qala'a and closer yet to other places. It does look like a possible match in all regards. I might be able to pinpoint a couple of precise spots it could be. And maybe we cannot call the wrong location a clue. In fact, I recall that and will update with this great new find. The flat-packed, rutted, trenched, randomly worked-looking soil fits the idea and what I see. I suspect the farm/forest confusion is from that this looks more like a tree farm than a real forest, and locals would know that. Being out in the desert, it can't really be natural. It's irrigated somehow, etc. Fine, all the tracks merge now. I'm curious if you'll find the spot. And it will be time to rename the massacre then. People teach how to use camera?! You can hear clear how one of them said CANON. but they filmed, standing, walking calmly? 3b* IMPORTANT! I watched many videos from this war but I remeber the scene when rebels speak THE SAME SENTENCE with the SAME spitting! 4. and maybe is important ... Libyan soldiers are always in green uniforms. Wish luck to our - now I will go to continue my search. There we can see the linked video was deleted because ImazighenLibya claimed to have the "copyright" on it. That deleted copy was most probably that one Libya SOS had made, but it had to vanish because it had the "wrong" explanation for the crime. Libya SOS claimed algelawy2009 to be responsible for the deleting, the comment is still on his youtube-chanel. This channel is worth a closer look, it seems quite professional (who helps here?) but contains a lot of racist stuff. For example "corrupted African black tribes & mercenaries" are blamed to support Gaddafi in the historical overview on the left. By the way: The "mercanaries" and killed soldiers shown in the videos from al-Qawalish always wear uniforms. But this one seems not to give any new information. I think it's quite sure know that the video was published aug. 5th by the Nafusa rebels and spread quickly the same day. Peet, you're awesome. I've changed the title just enough. As you can see, I might've been looking in the wrong area, and at the moment, I'm nut up to specifying a locale - it's basically like analyzing hairs and small bald patches, seen from perpendicular viewpoints. Any of the three tree farms around there could work so far ... next I wonder are there olive trees visible too? If so, we're maybe at the edge, next to an oilve grove. "It's probably easier for the rebels to imitate army slang than to get fiting uniforms." This is another aspect I'd like to consider more - these "Gaddafi soldiers." For one, what do you think of me hearing "Muammar Gaddafi?" Is that my imagination? It sounds remarkably like how Libyans tend to pronounce it. I don't know if real soldiers go around naming the leader all the time, but the ones that seem like rebel fakers do it regularly. All the trees I can are some kind of pine or cedar I guess, because of the thin straight trunks. I haven't seen the short, massive, branched trunks of olive trees yet in the video. So I don't think thre are olive trees, but I'm not an expert on that. I can hardly hear "Muammar Gaddafi" at the concerned scene, but I am absolutly not sure about that. We would really need a native speaker for to get further information about that. I looked again, and I see a different type of tree, but I don't know my trees. It's not olive, I guess. Just a glimpse, at app. 0:45 (depending on the version). Split trunks, to the northeast (by the directions I'm using), to the right of "soldier" #4, the guard. Could be nothing, mixed planting... I won't add it to the post unless it helps somehow. I need to get a translator ... some new possibilities are opening up now. Apologies to both Peet and . Two comments were marked as spam and I didn't catch it 'til now. I was wondering why it had gone quiet! Have reviewed, and will respond later on. Wow, thanks! This investigation has been paused for a while, but I will check these out now. The video is good evidence to add, if not reliable. The rebels in charge took the bodies back to Qala'a and claimed them as their own, with photos of them alive and dead. Hardly any faces were visible, and I don't know who those people were. I'll have to look more later. The 20-ish photos show about one black face (forehead only). The victims were about half black. So that's maybe odd. The framed screen grabs from the Facebook video has other images to the right I'm curious about. Who else filmed this, I wonder? The other things aren't new. The mapia find was very useful the first time. The screenshot might be helpful in case that changes. Didn't think to take one. I will update things soon. I am bookmarking a reference here, in case this is not linked elsewhere. Stange how everything starts turning up in late August: the Qalaa bodies are found and exhumed from 20 August onwards. And of course the survivor who can identify bodies. 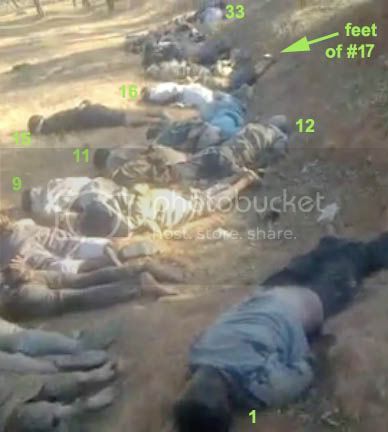 A day after the Galaa burial,[7 Septmber] another search team found 18 bodies near a road construction site dozens of miles away ..back to 2 surivors now,not 3. Who is Abrahams?? And as ever the survivor,somehow, Geography student Mohannad (sic) Berfat who is not among survivors listed elsewhere. The Khoms story stinks to high heaven. According to some sources, the men and boys were arrested by Gaddafi Regime troops on June the 2nd 2011. 3:13 - "This is from Pakistan? Source: The main rebel groups are from Libya, Pakistan and from Tunisia. Qatar – yellow flak jackets with brown patches, known as "chocolate chip"
no more than three miles down the road is the town where rebels are known to stash their dead just outside of town. Libyan Freedom Fighters from city of Zentan & Imazighen-Berber fighters, hands in hands, launch their assault on the key town of al Qawalish. After a six-hour battle against Gaddafi's militias and black African mercenaries (Ali Kanna brigade mainly from Niger), freedom fighters liberate the city and are able to move closer to liberate next objective, the city of Gharyan and thereby cut definitively the supply route to capital Tripoli. Libyan men show the site in a wooded area where bodies were unearthed from a mass grave of 35 men, outside of Galaa, Nafusa mountains, 120 kms from Tripoli, Libya. @ 2.21 scout camp area ? A mass-grave of alleged pro-Gaddafi soldiers has been discovered in a rebel-controlled area in Libya, according to British newspaper The Telegraph. A shocking instance where a crime had been committed by the rebels surfaced hours before HRW rolled out its sensational findings. five bodies decomposed beyond recognition were unearthed from a deep concrete basin linked to the region’s water pipeline, with cloth bindings scattered around, which provides evidence that the people had had their arms and legs bound. Judging by remnants of military uniforms, the dead had been the government army’s servicemen. Pistol and rifle cartridges were also littered on site. Twenty-seven of the 34 bodies were subsequently identified. Near the mass grave is a separate grave containing three more bodies that have not yet been exhumed, but have been tentatively identified based on footwear and other physical evidence.